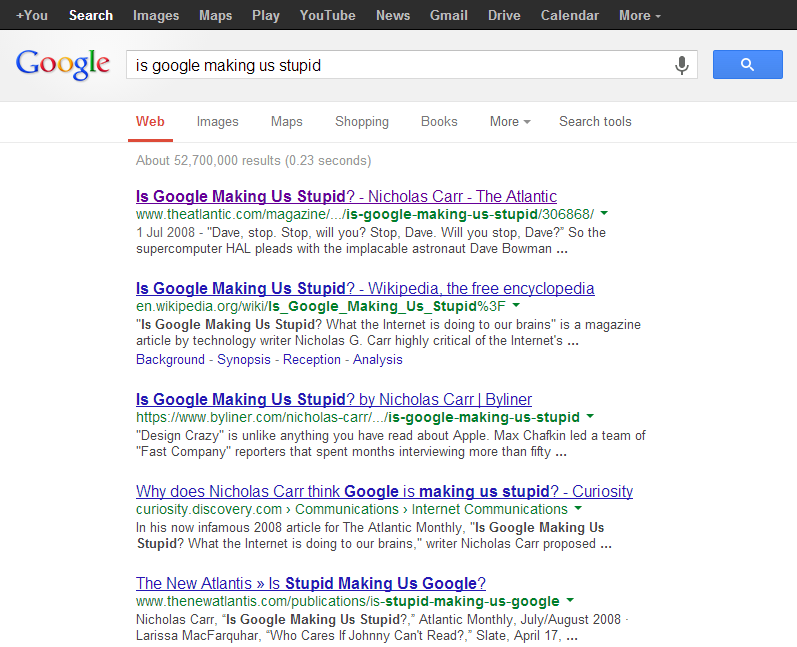 Is stupidity making us Google? My working stay in Sweden lasts around six to eight weeks. It was a real eye-opener at the time, but reading back through my 28-year old diary, the whole period feels distinctly analogue. A lot of the time, I don’t really know what’s going on and frankly seem to have very little way of finding out. I write longhand messages to friends and family on pieces of paper which are then carefully transported to them over a period of several days by a series of paid messengers. I lose track of what’s happening elsewhere in the world, and seem to struggle even to find out what’s going on in the immediate vicinity. I collect maps by the armful to help me get around. When I finally leave Gothenburg by train, I have no way of letting my family in Munich know that I’m two hours late, so they have to hang around the station just hoping I’ll turn up. But taken as a whole, one thing stands out more than anything else in those innocent, analogue days – the tremendous effort I put into trying to know stuff. And when I say know, I really mean know. You used to need to know stuff. Back then, it seemed really important. These days, you just need to feel reasonably sure that the stuff you’re concerned with is knowable, and that if and when it’s needed, you’ll be able to find it. In other words, we’ve slowly but surely begun outsourcing the knowledge that we used to carry around with us – principally of course to the Internet and our friends at Google, but also to phones, satnavs, e-readers, tablets, MP3 players and lots of other devices. So what are we doing with all the spare mental capacity that our outsourcing policy has presumably produced? Is it really all being spent on Angry Birds and watching cat videos on YouTube? Perhaps we’ve now got the potential to know a great deal more than we ever did before – albeit by proxy. Or maybe we’ve got surplus brainspace available to know and store more and more interesting/useful/esoteric/ephemeral stuff – leaving all the dull, heavy-lifting to the magic of the Internet. Neuroscientist Baroness Susan Greenfield for one has her doubts. She’s argued frequently and publicly that the human brain’s incredible ability to adapt may well mean that life online and our obsession with the “yuck! and wow!” of the Web will result in lasting and not necessarily desirable changes to how we interact, think and manage knowledge. She’s occasionally been criticised for her views, but she’s far from being alone. Even Google’s ex-CEO Eric Schmidt sounds concerned that we’re losing the ability to think deeply enough to retain genuine and profound knowledge. I worry that the level of interrupt, the sort of overwhelming rapidity of information — and especially of stressful information — is in fact affecting cognition. It is in fact affecting deeper thinking. For most of the past 500 years, the ideal mind was the contemplative mind. The loss of that ideal, and that mind, may be the price we pay for the Web’s glittering treasure. Outsourcing both knowledge and storage is nothing new. We’ve been doing it for thousands of years as evidenced by everything from the Pyramids to the Rosetta Stone. But the sheer power, speed and ubiquity of the Internet may well mean that unlike the mechanisms we’ve used in the past, this one has the potential to fundamentally change the nature of the minds that created it. This entry was posted in Popular culture, Reading and writing, Storage, Technology and tagged Baroness Susan Greenfield, Eric Schmidt, Google+, Knowledge, Mind, Nicolas Carr, Psychology, Storage, technology, Thinking, Thought on September 12, 2013 by followthehumming.